Peter Kurz, president of the Israel Baseball Association, is working feverishly to get the Israel baseball team into the 2020 Olympics. Here is how you can help the cause. 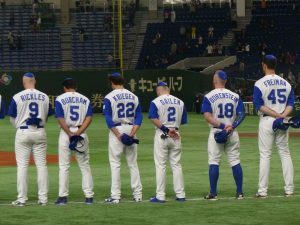 Seeing the Israeli flag waving over the baseball diamond at the Tokyo Olympics is a dream for every Jewish baseball fan. The Israel Association of Baseball has launched a crowdfunding campaign to help us send an Israeli baseball team to three tournaments in Europe in 2019 that we have to win in order to be able to qualify for the 2020 Olympics in Tokyo, Japan. With your help, we can raise the funds that will enable us to compete to reach the Olympic Games. Team Israel includes 10 professional Jewish players who have made Aliyah to be part of Team Israel for the Olympics. The incredible success of Team Israel in the 2017 World Baseball Classic is still clear in our memories. Seeing an Israeli team on the global stage of the Olympic Games will be a dream for every Jewish baseball fan. But we cannot do this without your help. By contributing to our crowdfunding campaign with a tax-free donation, you can share in this fantastic journey and in the future success of Team Israel Baseball at the 2020 Olympic Games. We would really appreciate any contribution, and we would also be very grateful if you could share this campaign with your friends and fellow Israel Baseball fans. Click here to donate, and forward this link to your contacts.